Food of a yogin, but foremost of a gourmande. Healthy and less healty tips and ideas. Winter is coming.. and its sugar cravings too. So here is the recipe of the BEST chocolate cake i have ever been able to do. Yes i know this is some serious thing to say. Give it a try and let me know ! Melt chocolate and butter in bain marie and let the mix cool down to 50C. Mix the eggs and the sugar + icing sugar then add the butter/choco mix. Mix vigorously to finally add the sifted flour. Pour the mix in a buttered baking pan and bake in the preheated oven 170C for 10-20 minutes (depending on the thickness of your cake, mine took slightly less than 20 minutes). With summer temperatures rising in the city and a watermelon left in my fridge, i wanted to do something a bit more fun than having a bite of a watermelon slice. On my look for summer recipes, this one came across. I tested and approved it ! Though i suggest some improvements and variations. Toss all ingredients in the mixer and puree them all together. Pour the mixture in popsicles molds and let them freeze for an hour +. I did mine with white sugar and i did not find it gave any additional taste. I will definitely try syrup next time. Also i put 1 fresh lime juice, but i like acidity so next time i will add one extra fresh lime in the recipe! Also i loved having the mint but could not really taste it until i chew it so i recommend to infuse it with the rest of ingredients (see below). Some recipe recommend to bring to heat in a pan the sugar/maple syrup with the lime and the mint. Which seems to me a good idea as it will helps the syrup melts and to infuse the mint flavors. Also after blending the mixture some recommend to strain the mixture through a fine mesh, which i did not find necessary as it felt already quite smooth and fine mixture. But hey ! why not ? If you want to play around with this recipe and make it boozy you can also add extra flavor with a bit of tequila, orange liqueur. Non boozy option would be to add blossom orange water. Can't wait to try those options ! As soon as the temperatures reach a certain level and as soon as tomatoes start having taste i cook gaspacho ! It is such an easy healthy recipe i can't help but keep doing it. You can play around with the ingredients and the quantities. After doing this reciped dozen of times i think i found my perfect balance with below quantities and ingredients. 1 tablespoon of tomato paste (not ketchup!). It will add a nice deep red color to your gaspacho. my favorite topping options: one diced boiled egg and olive oil toasted bread crumbs, basil or coriander leaves. Hmmm there is not much to be said about the preparation but chopped it all and mix it in a robot. Yes i told you easy ! I like it when the texture is quite smooth and i don't feel the vegetables chunks in it, so i usually let it mix for a good 5 minutes. I keep the seeds of the tomatoes and of the cucumber, but get rid of those of the peppers as they do not taste real good (even bitter). I advice you keep tasting as you mix it and add more of what you feel is missing. Sweet treat : Coconut butter ! To all coconut addicts, this is for you ! I am a huge fan of coconut under its various forms: coconut water, coconut milk, shredded coconut, coconut oil... now i can add to this list coconut butter ! Coconut butter is very different from coconut oil. It has a smooth, and velvety texture. Plus you can simply eat it with a spoon out of the jar. At room temperature it is quite solid, but warming it up for less than a minute in the microwave and it can be as melted as butter can be. I use it a lot on my morning toast under the jam, it is yummy ! You can also add a spoon in your Golden Milk ( i have brought back from New York the very good Gaia Herbs Golden Milk you can simply mix with coconut milk or rice milk). It is very easy to do (vs. very hard to find here in France in shops). The only challenge here will be to get the adequate consistency to your mixture. The blades of your robot might no catch any coconut flakes after running few minutes. So allow yourself 10-15 minutes or so to patiently scrap down the side of your robot bowl to make the magic happen ! Step 1: Mix the flakes, shredded coconut all together, add the coconut oil to make it smooth. Step 2: there is none ! It will take you a good 10 minutes of continuous mixing to get the final product. You can store your butter for few months in your cupboard, no need to put it in the fridge ! Easier than this you can't do ! Enjoy ! Ok it is not because i posted few days ago a green detox recipe (see here), i can't indulge myself a bit too. This recipe is definitely something to be shared with friends or family as it remains quite rich and portions are large ! It is something though you can keep in your fridge for 1-2 days or freeze for later in the month. In the pan cook in some butter the spinach for few minutes until it reduces. Mix it then with the goat cheese and put aside. Pre-heat the oven at 200C (th. 7). Prepare the bechamel, by melting the butter in a saucepan. Then add the flour while mixing it with a wooden spoon. Avoid getting the flour getting colored, so keep stirring together. Add the milk and keep mixing. The sauce should start getting thicker and smoother. Add salt, pepper and bit of nutmeg.Put aside. 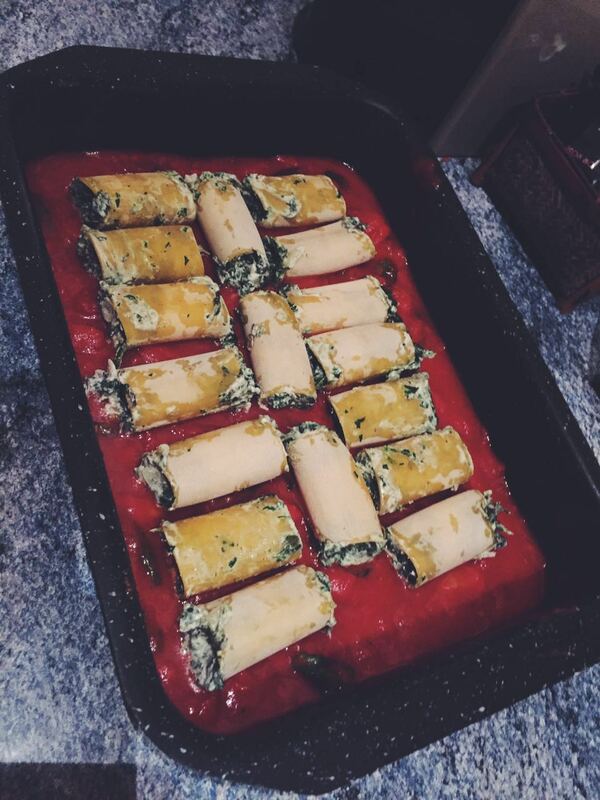 Fill the cannelloni with the cheese/spinach mix. Pour the tomatoes pulp in an oven dish, and place on top the cannelloni. Add on top the bechamel sauce and grate some Parmesan cheese on top. The whole dish should be covered for a nice even cooking of the pastas. Place the dish in the oven and cook for 30-40 minutes. Enjoy with friends or family !